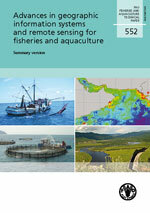 Advances in geographic information systems and remote sensing for fisheries and aquaculture. Summary version. Meaden, G.J. & Aguilar-Manjarrez, J., eds. 2013. FAO Fisheries and Aquaculture Technical Paper No. 552. Rome, FAO. 98 pp. Includes a CD–ROM containing the full document (425 pp.). This publication is an essential guide to understanding the role of spatial analysis in the sustainable development and management of fisheries and aquaculture. The publication is an easy-to-understand publication that emphasizes the fundamental skills and processes associated with geographic information systems (GIS) and remote sensing. The required spatial data and computer hardware and software are outlined, as well as the considerations necessary to implementing a GIS. Current issues, status and applications of GIS and remote sensing to aquaculture, inland fisheries and marine fisheries are described to illustrate the capabilities of these technologies. Emerging thematic issues having a spatial context in fisheries and aquaculture in the near future are also described, and finally useful clues as how best to overcome challenges to accomplishing GIS work are addressed. This publication is organized in two parts: the first is a summary version for administrators and managers, while the second contains the entire document intended for professionals in technical fields and academics. The full document is available on the CD–ROM that accompanies the summary version of the publication. FAO encourages the use, reproduction and dissemination of material in this information product. Except where otherwise indicated, material may be copied, downloaded and printed for private study, research and teaching purposes, or for use in non-commercial products or services, provided that appropriate acknowledgement of FAO as the source and copyright holder is given and that FAO's endorsement of users' views, products or services is not implied in any way. All requests for translation and adaptation rights, and for resale and other commercial use rights should be made via www.fao.org/contact-us/licence-request/en. FAO information products are available on the FAO website (www.fao.org/publications) and can be purchased through publications-sales@fao.org.